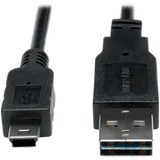 Tripp Lite's U026-025 USB 2.0 Hi-Speed Active Extension Cable (M/F) increases the length of a device cable an additional 25 feet with no danger of signal loss or decrease in performance. Connect the male plug to a USB port on your computer or hub and the female end to a USB device cable. 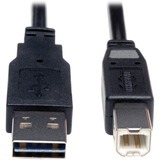 A built-in bus-powered signal booster ensures peak USB 2.0 signal quality. 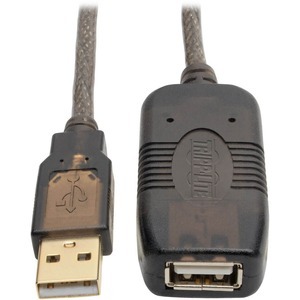 Backward compatible with previous USB generations, this active USB extension cable supports data transfer rates up to 480 Mbps. 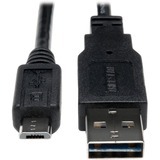 The U026-025 works with all computers, devices and cables with USB-A connectors, and provides up to 150mA of power to the connected device. 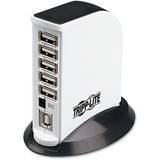 An external power supply or powered USB 2.0 hub is necessary if the connected device requires more than 150mA. Premium foil and braid shielding delivers reliable, error-free signal quality and protection from EMI/RFI line noise that can distort or destroy data. Molded gold-plated connectors with corrosion-resistant gold-plated contacts provide maximum conductivity and minimize data loss. Integral strain relief gives the cable extra flexibility, reduces stress, and helps the cable and connectors move freely without cracking. 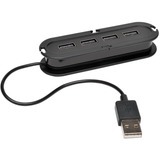 Extends Transmission Distance Between USB Devices an Additional 25 ft.